A Wider Bridge is the North American LGBTQ organization building support for Israel and its LGBTQ community. I joined the organization as a website and social media manager in October 2012 when the organization was just starting and was looking to brand itself online. I was part of the team until November 2017. When I joined, the number of website pageviews per month was around 20. It had less than 200 fans on Facebook and an Alexa rank of 7,320,609. I built an online magazine inside the website that dealt with these three types of content. 90% of my social media posts lead to the website, where people could read the full article and on the way discover the work of the organization and its events. By 2017, A Wider Bridge had a significant presence on the web. The web-magazine has organically increased the SEO ranking on Google and other search engines. Articles appeared on the first page in Google searches of people and phrases that related to the LGBTQ Israeli community. The website traffic has gone to hundreds – and some months thousands – of pageviews per month. The Alexa ranking peaked at 814,530 (which is incredible for such a narrow niche). Celebrities like Rosanne Barr and now-Governor of Colorado Gerald Polis have tweeted about the organization. 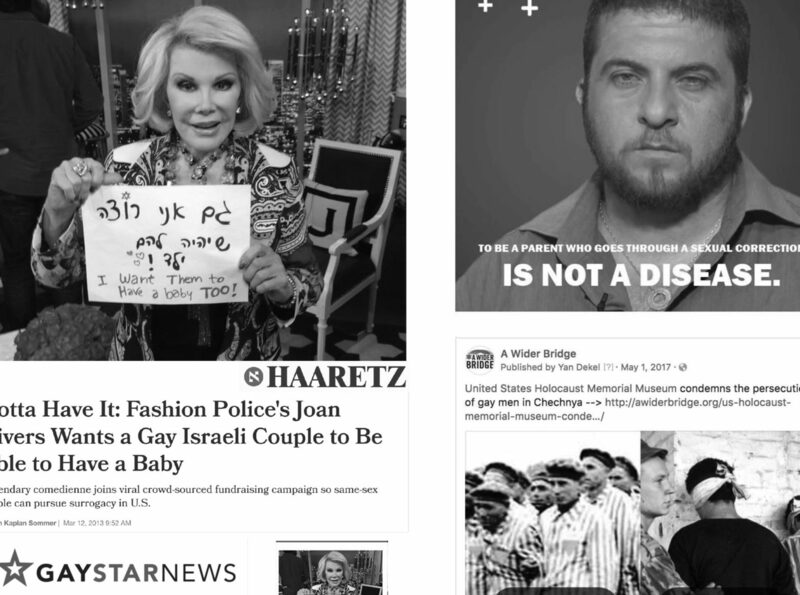 Mainstream American LGBTQ magazines have followed up on a social media viral photo of Joan Rivers helping the community. In the case of the organization A Wider Bridge, the social media work has had a tremendous effect on the relevance of the organization and the development of the brand.